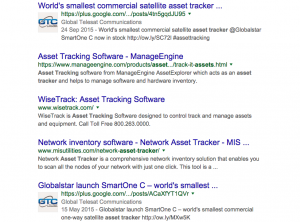 Here are a few searches that we have worked hard for our clients to achieve. sat phones uk – Global Telesat sell Satellite Communication Equipment and have appeared on Page 1 and 2 for many varied phrases related to the Sat Phone industry including; sat phone rental, satellite phone accessories, asset tracker (utilising the power of Google+, 2 posts on page 1 including profile pic! ), satellite phone airtime. The list goes on and demonstrates that although position 1 for 1 keyword is great it is far more valuable to have a broad swathe of pertinent phrases that relate to your core products or services. 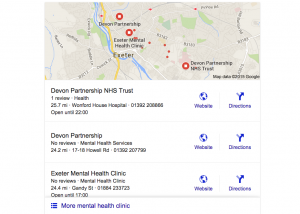 exeter mental health clinic – Jonna North has two entires including the very powerful Local Listing in the Map that sometimes shows up on Page 1 for local based results.